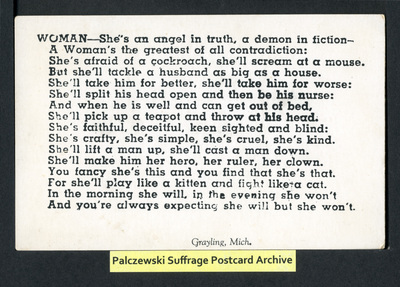 WOMAN - She's an angel in truth, a demon in fiction - A Woman's the greatest of all contradition: She's afraid of a cockroach, she'll scream at a mouse. But she'll tackle a husband as big as a house. She'll take him for better, she'll take him for worse. She'll split his head open and then be his nurse: And when he is well and can get out of bed, She'll pick up a teapot and throw at his head. She's failthful, deceitful, keen sighted and blind: She's crafty, she's simple, she's cruel, she's kind. She'll lift a man up, she'll cast a man down. She'll make him her hero, her ruler her down. You fancy she's this and you find that she's that. For she'll play like a kitten and fight like a cat. In the morning she will, in the evening she won't And you're always expecting she will but she won't.